Know: Scripture teaches us that God does not play favorites. He desires that all people come to know Him. Think: Live with the mindset that all people are created in the image of God and His offer of grace is without restrictions. Do: See all people as loved by God and seek to get the gospel to them, even those who are not life "us." B1 Even seen or experience favoritism? What did you feel like? B2 How did your parents treat you? Were you their special one? B3 Do we have any favorites? Our spouse, child, friend, parent, aunt, uncle, etc. B4 Does God have any favorites? Consider 1 King 8:14-19 and Acts 13:17. God does make choices. B5 What is the difference between favorites and prejudices? B6 What is the attitude, motivation, for prejudice? (Pride--we are the best). Defined--an attitude that a person is superior to others whether true or not. Accomplishing a difficult task as education, etc. would be a feeling of pleasure of arriving at one's goals. The other side of pride is the arrogance of a person that they are superior to other people due to their attitude. This love for self above all is the original sin. Pride is the sin that brought down the devil and each of us. We are born with it. Angel sent to Cornelius to have him send for Peter. 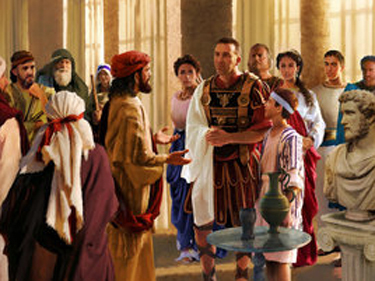 Why did God choose this method of bringing the gospel to Cornelius and his family. (Cornelius needed to believe God and show obedience and belief by sending for Peter. Faith is always tested). Why was Peter so against the message to get up and eat? Why would Peter hesitate to go with the men from Cornelius? What temptation did Peter face when he met Cornelius? What lesson had Peter learned in his response in Acts 10:28? What did the proud Jew, Peter, learn about God's character in Acts 10:34-35? What are the main points of Peter's gospel message in Acts 10:36-43? What was the response of the Jews that traveled with Peter in Acts 10:45-46? B9 Some Christians (?) respond with joy, when someone they perceive is evil, saying things as, "They got what they deserved." What does God teach us in the Scriptures? Do I have any pleasure at all that the wicked should die?" says the Lord GOD, "and not that he should turn from his ways and live? (Ezekiel 18:23 NKJV). For I have no pleasure in the death of one who dies," says the Lord GOD. "Therefore turn and live!" (Ezekiel 18:32 NKJV). Say to them: 'As I live,' says the Lord GOD, 'I have no pleasure in the death of the wicked, but that the wicked turn from his way and live. Turn, turn from your evil ways! For why should you die, O house of Israel?' (Ezekiel 33:11 NKJV). For this is good and acceptable in the sight of God our Savior, who desires all men to be saved and to come to the knowledge of the truth. (1 Timothy 2:3-4 NKJV). The Lord is not slack concerning His promise, as some count slackness, but is longsuffering toward us, not willing that any should perish but that all should come to repentance. (2 Peter 3:9 NKJV). God wants repentance. We are all sinners and rebels, but God graciously opens our eyes and hearts to understand the truth about ourselves and the truth of the Gospel of His Son, the Lord Jesus. B10 Have missionaries and others in the past showed prejudice? Are we supposed to push our lifestyle on new converts? Are we supposed to teach the Bible lifestyle? B11 Why does God choose to have humans present the Gospel instead of angels or doing it Himself? B12 What happens to those who never hear the Gospel? (According to Romans 1, people have some understanding through creation. The Holy Spirit works in their hearts, too. They have to place faith in God just like all people have to. The Gospel has always been the same). B13 Do we still see prejudices when people share the gospel? B14 How are we going to prevent these bad attitudes this week?